Love the quilt--and may need to do some of that 15 minute stuff myself soon! Beautiful quilt top and love the timer idea! I use a timer too! And I thought I was the only one. Your Ruby looks lovely Tanesha! 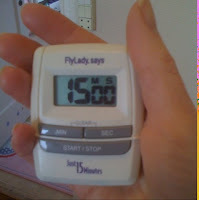 I have been collecting a load of Ruby and am now deciding on a pattern…Great idea with the timer. I don't really enjoy machine quilting so this would be a great way to chip away at it.